My favorite feature was this Japanese themed one. I want to make almost all of these patterns, but this simple t-shirt dress with a twist at the middle is at the top of my list. An easy pattern, but just interesting enough to make it worthwhile. This pleated / wrap / I don’t know what to call it dress is so interesting. I’m not sure if it would look great on me personally, but I can’t wait to see someone else make it up. This wrap front dress would be flattering on so many people. Allison C. already made it up, and it looks FANTASTIC on her. I love funky jackets, and this one is no exception. The inserts at the elbows are pleated leather. 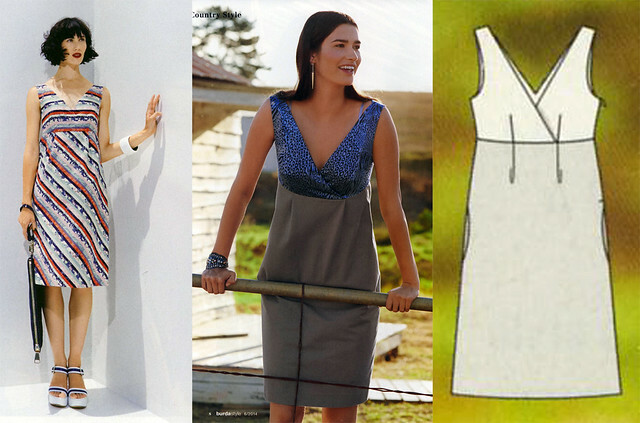 This dress and top with binding around the armholes has a lot of potential. I think I’d make the top version with some blingy trim. This is a simple silhouette, but the fabric on the left makes it sing. The same dress was shown earlier in the issue with an odd color-blocking of olive gabardine and peacock blue silk. I don’t get it… Just goes to show how important fabric choice is. This is a tall pattern so I won’t be going near it, but I’m going to bookmark the idea of using stripes this way for future reference. 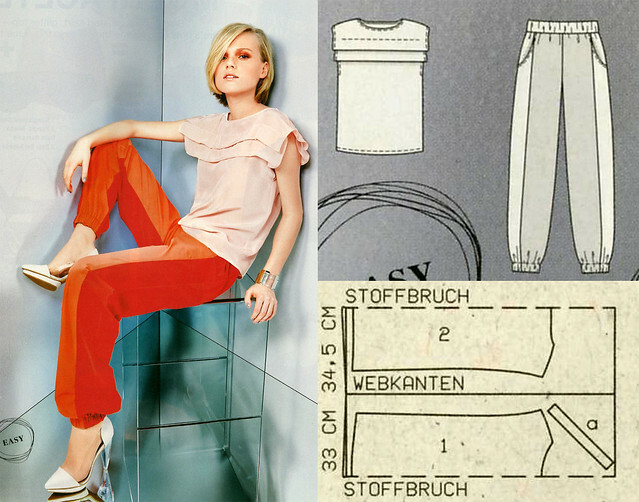 The “sewing lesson” with step by step illustrations is this vest with cargo pockets… the only pattern in the Japanese feature I didn’t care for. Oh well. There was another feature just for shorts patterns, which is great because I really need some new shorts. 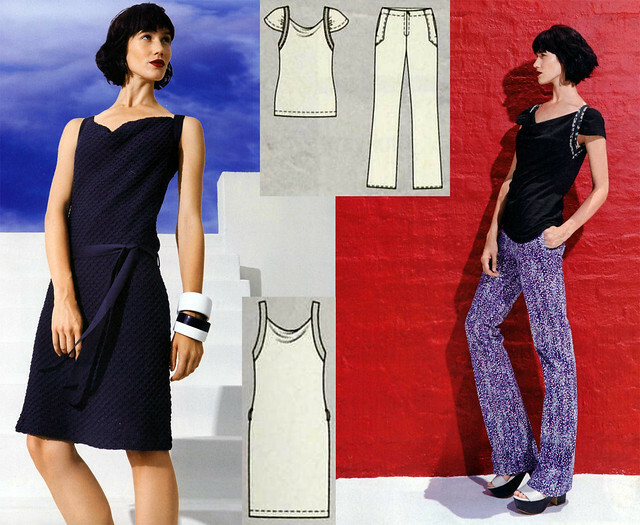 I’ve been wanting to knock off this Zara skort since last summer (shown bottom right), and Burda included their own version in this issue. 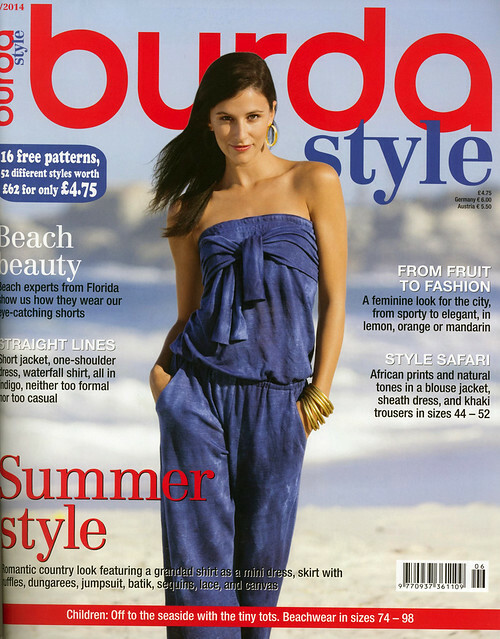 I now have versions of this pattern from Manequim, Simplicity and Burda! Melissa at Fehr Trade hinted she was going to do a comparison post of all three patterns so I’m just going to sit tight and let her do the heavy lifting of choosing the best version. If you like sailor shorts, this is a cute pattern. Personally I don’t like to have to undo that many buttons to go to the bathroom. Maybe I could just cheat and put a zipper in the back. Finally, a couple of cute athletic shorts patterns. I’m not sure how to summarize the patterns in this next feature, but I liked it. 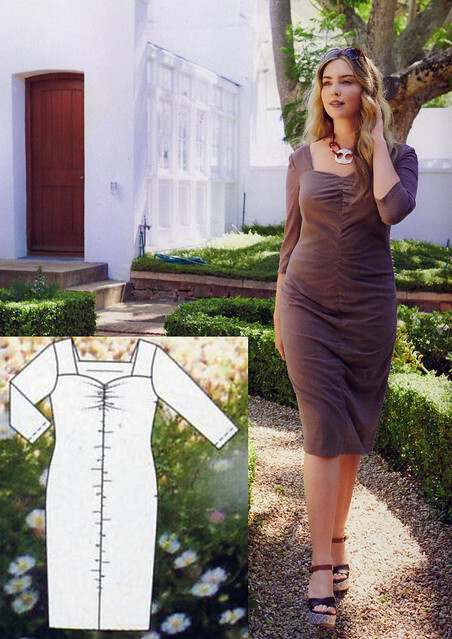 This shirtdress has a concealed button placket, and then a yoke around the hips where the placket disappears and then starts again. Weird or cool? I like it. 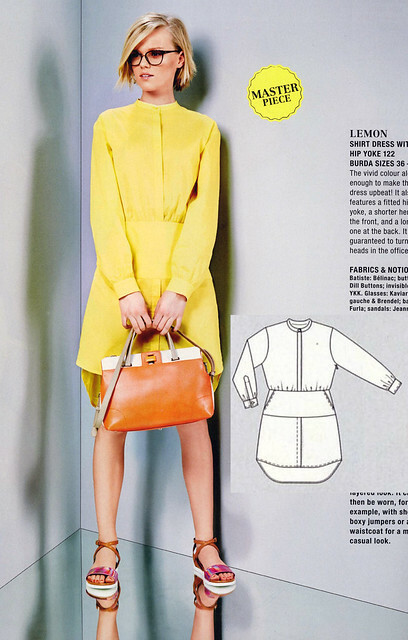 This shirtdress is paneled and has gathers under the bust and a back tie. This one was made in a washed silk, which I imagine feels amazingly swishy to wear. Wheee! You’ll probably either love or hate the folds on this top, but I like it and I think it’s a great way to use small cuts of fancy fabrics you have lying around to make something a little more interesting than a tank top. The pattern instructions say it requires 1 1/4 yards, but the cutting layout shows a lot being wasted by the bias binding for the neck. If you used a different fabric for the bias tape I’m sure this would be under a yard. Next up is the plus size feature. This safari style jacket isn’t that unique of a pattern, but I’m surprised how good it looks in silk. My favorite plus size pattern was this sheath dress. I especially like the turned up cuffs on the short sleeves. 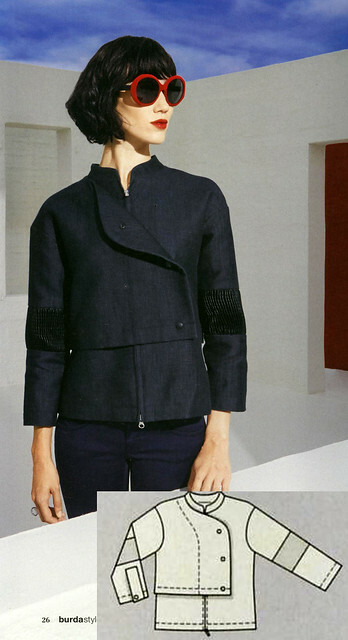 And it has pockets! 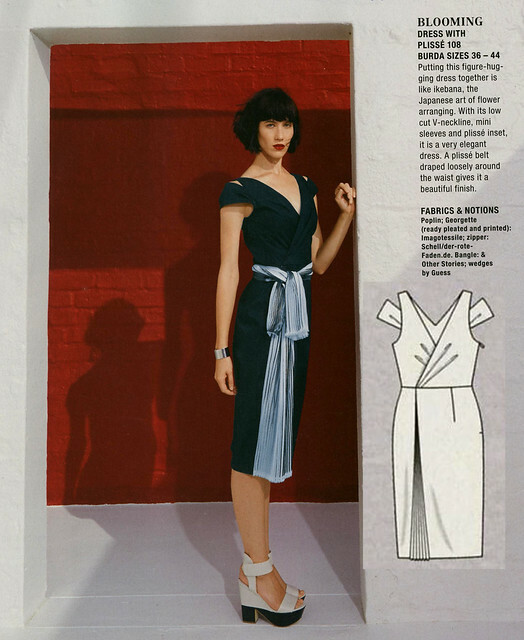 The only reason I included the ruched sheath dress is to ask, doesn’t it seem like Burda publishes this pattern at least once a year? I like it, but c’mon… give us something new. I might be losing my mind, but I’m intrigued by this refashioning project where they took the top part of a pair of jeans and sewed it to a silk scarf. I don’t know if I like this one specifically, but I can imagine liking it with fabrics with less contrast. I can’t end the review without poking fun at a few things… The location of the poofiness of the gathers on this shirtdress is just tragic. Does that fabric have a lot of body, or are you just happy to see me? 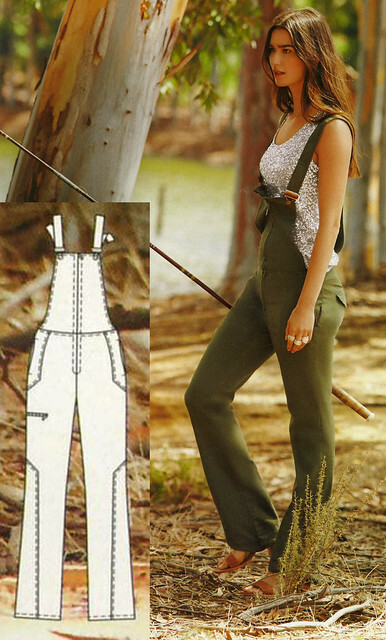 I know overalls like this are all over the runways, but still… Skin tight overalls are just wrong. And then there was this monstrosity in the plus size section. I can see the pants looking okay with a fitted shirt, but the top here should just be burned. And the two together? I just can’t… Pop quiz time! What is this silhouette called in the fashion industry? If you said “Teletubby”, you get an “A”! I also would have accepted “Oompa Loompa”. Even though I read this magazine. I still enjoy you commentary. I found two that I want to make later. My pants are finished! And as for the skin tight overalls, that just made me laugh it’s so 70’s German. I want one too! The US version sadly has nothing that I really want to sew. But, I love those sun dresses. And they would go with Tinky’s purse. I love that purse. Oh! Love your comments! Please tell me how to get this magazine in the mail. And not just to start a subscription but to get this issue specifically. There are many an item i would like to try. And yes, Teletubby it is! 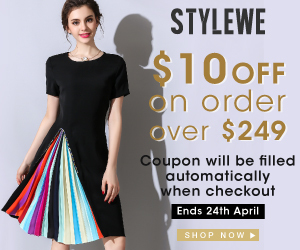 I seem to see a lot of this silhouette lately and do not understand it as it is not flattering on anyone. As I grow a little larger I too want more ease in my clothing through the warm months. This I will not wear. 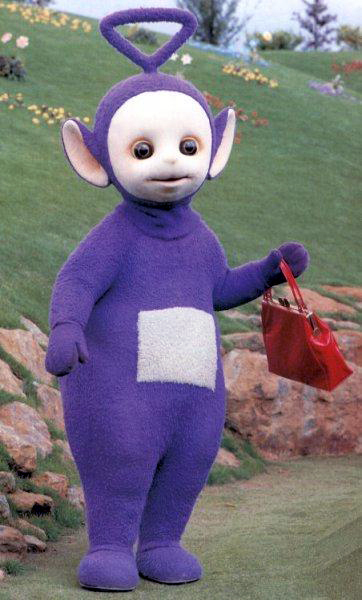 I do like Teletubby’s red purse! Tattered Cover bookstore in Denver stocks it, but I think Jill might have called them already. 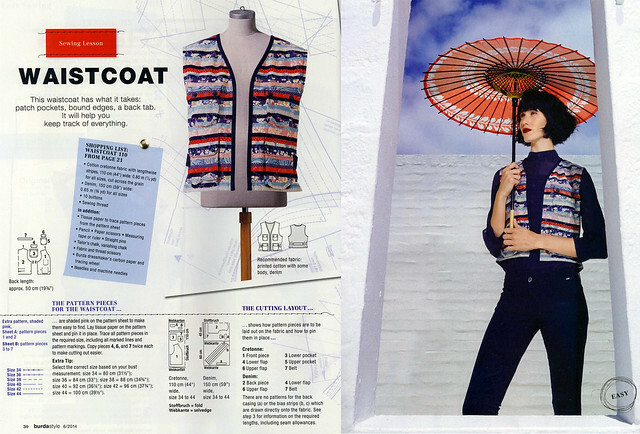 GLP (the company that sells the subscriptions in the US) will sell you back issues, but usually they are sold out by the time I call: https://www.glpnews.com/EN/Crafts/Burda1.html When I miss an issue I usually end up buying it off eBay, but that ends up costing $15-20 an issue instead of the $7.50 you pay with a subscription: http://bit.ly/1qi8u1X You can also buy the digital version of the patterns you like off the BurdaStyle website at $5.99 a piece. The other option is to trace them off from my copy! I’m always happy to bring them to the meetups. I’ll even loan you a seam allowance ruler and some transfer paper.